Gen X, where art thou? I was looking at some marketing demographic information not long ago. The study I was reading was comparing the use of social media by Baby Boomers and Millennials. 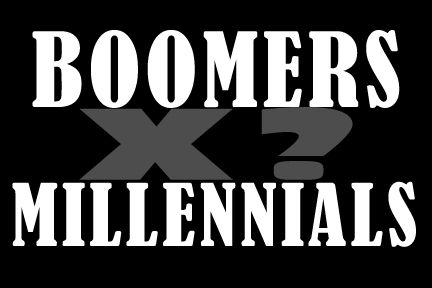 I thought to myself, "What happened to the Gen Xers?” It seems these days that every study focuses on the cultural shift from the Boomers to the Millenies and totally ignores Gen X, like they are the middle child, and not all that appealing at that. If you are part of Gen X, you know what I mean. They pay attention to your incense-burning, war-protesting, psychedelic-hippie parents and your sttsp (stuck-to-their-smart-phone) kids;) lol! But what about you? You would be smart to pay attention to Gen X if you have a product or service to sell. There are several reasons. One, they like to spend money on things they may not need, but really want. Two, they live in big houses that have lost value since 2008, but recently have bounced back to pre-recession values. We like to pigeon hole whole groups of people in our society. In marketing, we use this information to figure out not only what to sell a particular group of people, but how to go about it. Every generation of people grow up with certain values and attitudes. A lot of that is shaped by how many choices they were given at a very critical time in their life. By the time someone is 18-25 years old, their values are pretty much set for life. This is the time when people are becoming adults and making choices for themselves, usually for the first time. It sets the way they will view the world around them for the rest of their lives. We call this the coming of age period. Figure out what happened with a generation of people between 18-25 years old and you will be able to sell them for the rest of their lives. So where does that leave us with Gen X? This particular group of people was born between 1965 and 1984. They are currently between the ages of 31-50. That means they came of age between 1983 and 2002. What happened to the U.S. economy in those years? It had unprecedented growth. Houses were being built larger than ever before. The age of home ownership came much younger. Materialism was king, and along with it, so was personal debt. Money was easy to get and much easier to spend. The largest single asset most Gen Xers had was their house. Along came the Great Recession and the banking crisis connected with the mortgage industry, and no one had assets to borrow against. Gen X was caught between the proverbial rock and an overpriced house. But alas, as the real estate market makes a big rebound, home values are on the rise, which means Gen X has something of value once again. And Gen X likes to spend money. So now is the time to market to them once again. Now you may be thinking that after going through the worst economy in our lifetime Gen X will be more reluctant to go into debt to buy stuff they don’t really need once again. But remember their coming of age period. It is the guiding value of their lives. They believe that money buys happiness. It is how their parents kept them happy when they were growing up. It is how they made themselves happy when they became adults. What I am telling you is the last seven years of economic setbacks is no match for what a generation has come to value. So if you have stuff to sell, make sure you are not overlooking Gen X in your marketing plans. They have money once again.